So, we all know that Caskey Eats, but did you know that Caskey cooks too? Welcome to a new column of the website where I share with you some of the delicious treats I make in my very own home. Today, I've got a delicious and easy light dinner that you can make so fast and easy, you won't believe it. I was downtown near Union Square, reviewing a restaurant for an upcoming post and after I was done, I wandered over to the Union Square Farmers Market. For those of you who've never been, this is one of the best farmers markets in the city. They operate 4 days a week and there are dozens of stands. You can find fresh flowers, wine, meat, seafood, honey, cheese and of course, lots of produce. Produce suppliers from all over the state bring in their amazing fruits and veggies. You can't find better stuff at a lower price than you can at this market. Since I consumed an enormous amount of nuggets to write the latest review, I knew I would want a light dinner. Afterwards, I stopped in at the local Whole Foods to get a few more things and found a great ingredient that I'll tell you about in the recipe. Instructions: Rinse your tomatoes and basil leaves in cold water and pat dry with a paper towel. Slice the tomatoes and mozzarella into thin-ish slices. I cut mine a little smaller than a half an inch. If they're too thick, it'll be too hard to eat. 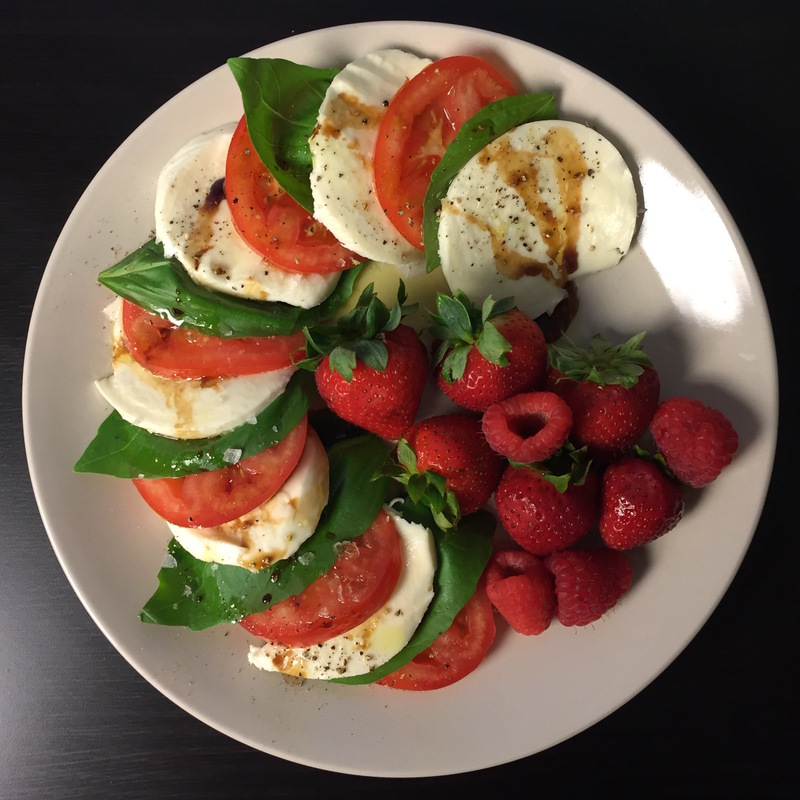 My mozzarella ball was pretty big (no snickering) so, I had more slices of cheese than I did of tomatoes. I ate them. It was clearly not a problem. Now arrange the ingredients on a plate, alternating ingredients and fanning them out on the plate. Not only does this make it easy to eat, but it looks so pretty! You get every taste in every bite. 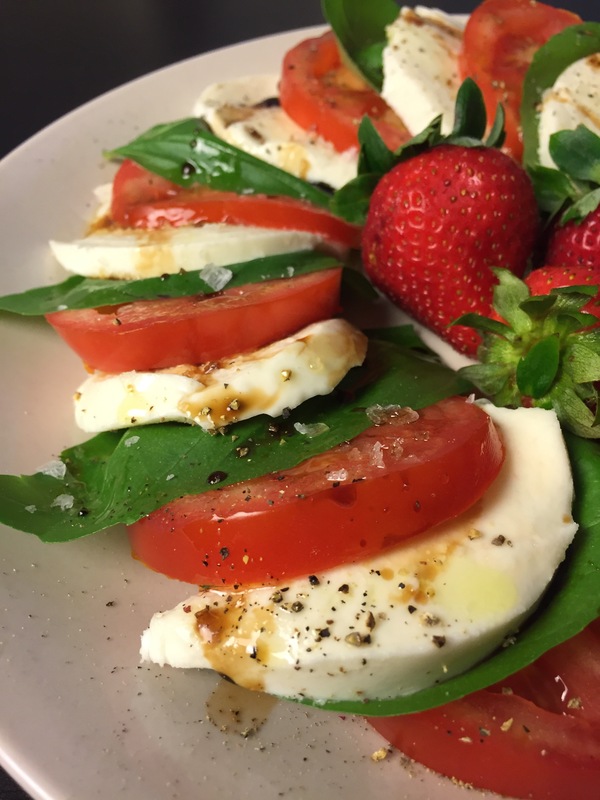 Once you've laid out the ingredients, a healthy drizzle of olive oil and balsamic vinegar and salt and pepper will complete your salad. You can use regular balsamic, but I really like a Balsamic Glaze. It's handy to have in your cupboard and you'll find it useful for many different recipes. Don't forget the salt and pepper. It makes all the difference. I have no problem using plain old store brand table salt when cooking something, but for finishing, it's totally worth it to spend a few bucks on a finishing salt. These are usually a more flaky salt intended for sprinkling on top of food right before serving. The bigger flakes mean the salt has more surface area and provides a stronger burst of flavor. I have a box of some fancy salt that I got as a Christmas gift and it had the best crunch of salty flavor when eating. A link is on the right. That's all there is to it! When you're eating this, make sure you get a little bit of all 3 ingredients in each taste to really take in the flavor of this simple and delicious salad. Since I found some great berries at the farmers market, I rinsed some strawberries and raspberries and threw a handful on the plate. At Whole Foods, I found a Rhubarb syrup from Morris Kitchen and made some homemade soda. Fill a glass full of ice with sparkling water leaving room for syrup. You can use any sparkling water from the store, but I have a SodaStream and it's one of my most favorite kitchen gadgets. Eyeball the syrup into the glass and adjust based on taste. You'll use about the amount of a shot glass. This particular syrup is very similar to a shrub. A shrub is a syrup meant for cocktails and has a base of apple cider vinegar. You can using them without booze and I find that a good shrub with sparkling water makes an amazing soda with a nice mix of sweet and the tang of the vinegar. 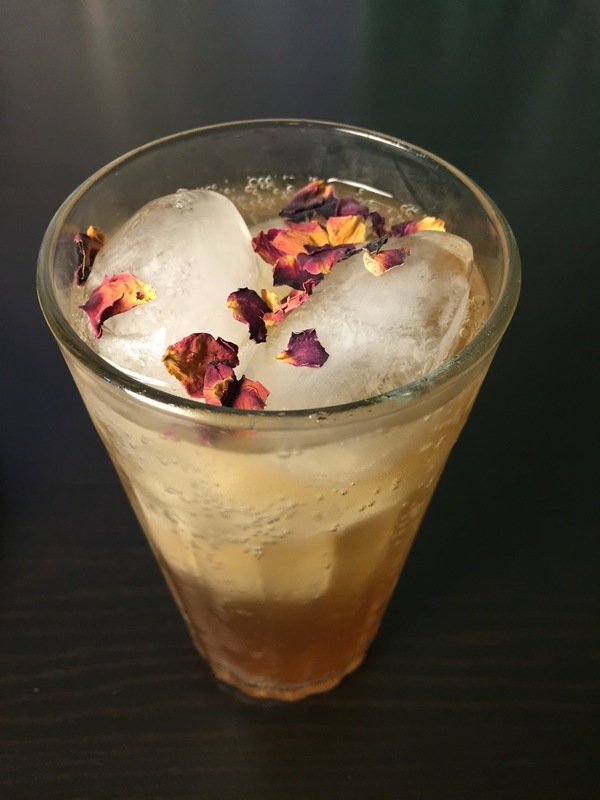 If you want to be fancy, you can sprinkle a few dried edible flower leaves on the top of the drink, but they're completely optional. Based on their website, it looks like the Morris Kitchen Rhubarb Syrup is sold out online, but I've linked to another flavor on the right side of the page. You can find dried edible flowers all over. Mine came from Bazaar Spices in Washington D.C.
Well, there you have it. An easy and delicious light dinner made with fresh ingredients. 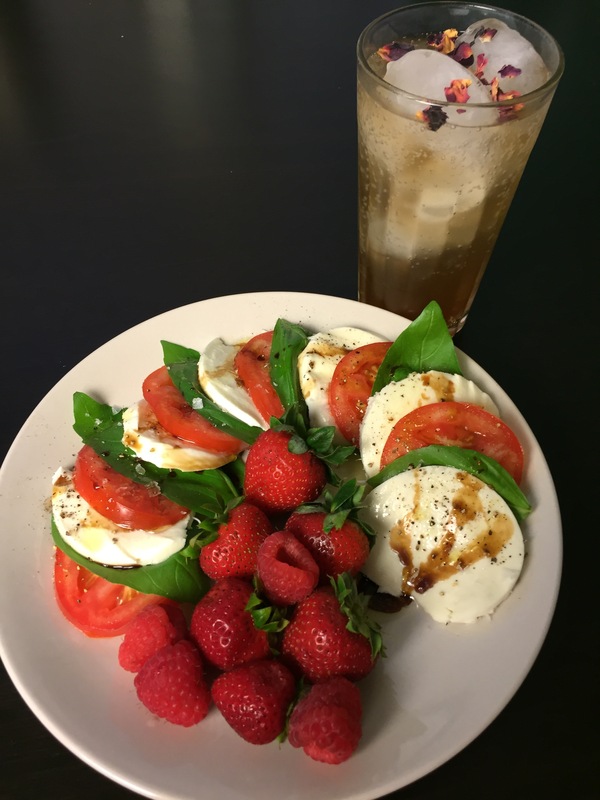 This was a satisfying no-cook dinner to have on a hot summer night.